This is a dish to impress! I used handcrafted Italian pasta by Torinio that derives its unique colors from natural ingredients. 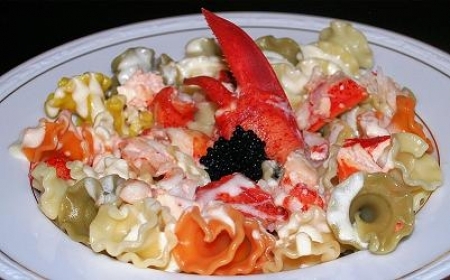 The shape of the pasta just begs for seafood, so I added two of my favorites, lobster and caviar. Feel free to experiment with your own seafood mix. The creamy shallot and chive mixture and lemon infused olive oil beautifully compliment the lobster and caviar. Lemon Infused Extra Virgin Olive Oil is being used and can be purchased on-line at Spicewood Food Company. Serves 4 or for date night cut the ingredient amounts in half. I would highly recommend NOT cutting the sauce ingredients in half, because you can use it as a sauce to pour over chicken the next day. This means you would only need 1 lobster and use only half the box of pasta for serving 2 people. Fill a very large pot or stock pot half way with water and bring to a boil. Place live lobster(s) into boiling water head first. Cover and boil for 15 minutes. The lobster(s) should be a deep red color. Remove from the pot and let cool for a few minutes. Twist each claw off at the base of the body of the lobster. Place claw on a hard surface and cover with a towel. Hit claw with the palm of your hand to break shell. Remove all lobster meat from joint and arm of the lobster. Take remaining lobster tail and cut down the center lengthwise with kitchen shears. Remove meat and rinse. For a step by step process of removing the lobster meat see Removing Meat from Cooked Lobster technique. Cut the tail into pieces leaving the claws whole. Set aside and continue with the sauce and pasta. In a large pot, add water and cook pasta according to package directions and drain. In a medium sauce pan, melt butter and sauté shallot over medium high heat until soft. Add vodka and reduce by half for. Add milk and cheese and whisk until melted. Add lemon infused olive oil. Add pasta lobster, reserving claws for decorative purposes. Gently stir. If sauce seems too thick, add a little more milk. To serve, divide pasta between four bowls making sure each one has about the same amount of lobster. Place a claw on top and add a dollop of caviar and serve immediately. Try Roederer Estate Sparkling Wine (California), J Cuvée 20 Sparkling Brut Wine (California) or Zardetto Prosecco Brut Sparkling Wine (Italy). For beer lovers try Paulaner Hefe-Weizen (Germany) with lemon wedges or Franziskaner Hefe-Weisse (Germany) with a lemon wedge. Have you replaced the milk with cream? Just wondered if that would work. Looks yummy!